Word can print a full page of the same label or a single label. Just type in an address, the name for a file folder or a CD case, or text that you want on some other kind of label, and then choose a label configuration. 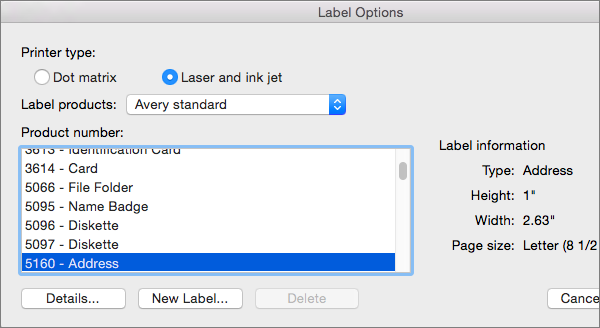 If you’re printing onto Avery labels, you can use an Avery template. 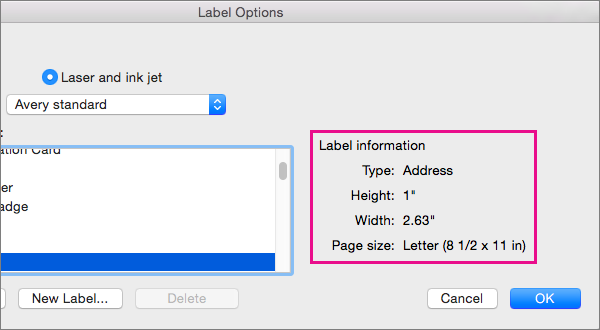 If you want to print labels that will have different text on each label, you can set up a new label document and type each label. But if you have a data source, such as an address list in an Excel spreadsheet or the contacts information stored on your Mac, you can merge that data with the labels document to fill out your labels. For more information about merging data with labels, see Create mailing labels in Word by using mail merge or Mail merge in Word for Mac. Tip: If you want to make return address labels, see Create return address labels. On the Mailings tab, click Labels. Select your label supplier in the Label products list. Select the label type in the Product number list that matches the product number of your labels. If you don’t see your product number, you can follow the instructions in Set up a custom label to configure a labels document that matches your labels. Type an address or other information in the Delivery Address box. To create a label for an address stored in the contacts list on your computer, click the Insert Address button. To change the formatting of text in Delivery Address, select the text, Control-Click the selection, and then click Font or Paragraph on the shortcut menu. Make your changes and then click OK. Under Number of Labels, select Full page of the same label or select Single label. If you’re printing one label, enter its location in the Row and Column boxes. For example, if you have a 3 by 10 grid of labels on your sheet, and only the last label is empty, type 10 in the Row box and 3 in the Column box. Click OK in the Labels dialog box. Word creates a new document with the information from Delivery Address laid out for printing to the type of labels that you selected. If Word does not list the label product that you have, you can still print to the labels that you have. You start by selecting a label type that is close to what you have, and then modifying the measurements so that they match your labels. Carefully measure the labels on the sheet you have, noting the measurements and the number of labels on a sheet. Measuring the actual labels may be more accurate than relying on the measurements supplied by the manufacturer. In the Product number list, select a label type similar in size to your labels. Look under Label information to see whether the selected label is close to your label. In the Label Options box, click New Label. Word displays New Custom laser or New Custom dot matrix, depending on the type of printer specified in Label Options. Type a name in the Label name box, and change the numbers in the boxes to match the label product that you have. 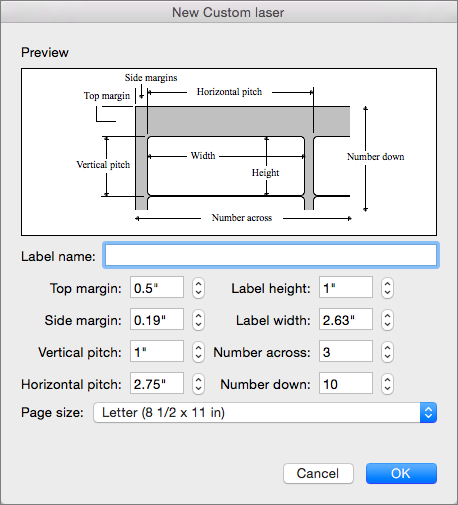 The Preview box shows how the measurements apply to the layout of the label sheets. Click OK to accept the measurements. From this point onward, you can follow the steps in Type a page of different labels, starting with Step 7, where you click OK in the Labels dialog box to create a labels document. 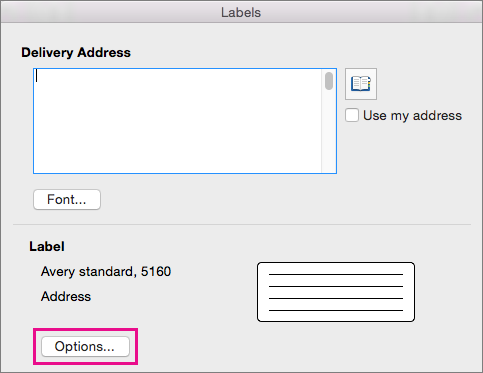 Note: You can't print a mailing label in notebook layout view or publishing layout view. On the Tools menu, click Labels. In the Address box, type or edit the mailing address. On the Label products pop-up menu, click the manufacturer of your labels. Under Product number, click the type of label that you have, and then click OK. Under Number of Labels, click Single label. In the Row and Column boxes, select the numbers that correspond to the label on your label sheet that you want to print. Insert a label or label sheet into your printer. In the Labels dialog box, click Print. Select your options, and then click Print. Select any options that you want, such as the number of labels, label type, and printing options, and then click OK. In the label document, click where you want to put the graphic. On the Home tab, under Insert, click Picture, and then click Picture from File or Clip Art Gallery. To resize the graphic, select it, and then drag a corner sizing handle to the size that you want. To maintain the height-to-width ratio, hold down SHIFT while dragging a corner handle. Under Wrapping style, click Square. Under Horizontal alignment, click the alignment that you want — Left, Center, or Right — and then click OK. Tip: To use the same graphic for each label, you can adjust the size and placement in the first label, and then copy the picture and paste it into your other labels.